BBA Thammasat wins CFA Thailand Investment Research Challenge for second time CFA Thailand hosted the second <?xml:namespace prefix = st1 ns = "urn:schemas-microsoft-com:office:smarttags" />Thailand investment research challenge that is open to students both at undergraduate and graduate levels. The competition provides hands-on experience in equity research. This year the company chosen for study is Home Products Plc (SET: HMPRO), Thailand's leading distributor of goods and materials for construction, addition, refurbishment and renovation of buildings and residences. The BBA team made it through to the finals based on the quality of the research report. 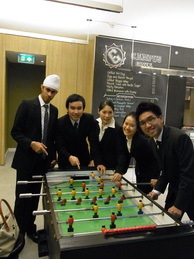 Finalists included students from NIDA, Assumption University, SASIN, and BBA Thammasat. Posted date: January 10, 2011 � 13:00 hrs.